Breaking down a country’s unique cuisine into an easily digestible and halfway entertaining article without getting lost in footnotes and cross references can be a herculean task. Especially so if the author was born, raised, and has spent his entire life in said country—which in my case is Germany. Cuisine is usually one of the first things we get to know about a foreign country. Cooking is a universal language. Not everyone speaks it, but everyone understands it. So what’s German cuisine? Even as a born and bred German I have a hard time answering that question without resorting to clichés. Is it Sauerkraut or is it Döner? Maybe even both? For the sake of simplicity and to further my hobby anthropological research I want to dedicate this text to clichés. If Sauerkraut is Germany’s favorite food, potatoes are definitely hot on the heels. Be it mashed potatoes, potatoes au gratin or a heap of crispy fries, Germans just love their potatoes. However, the small brown spud had travelled a long way before being embraced as a staple of Teutonic cuisine. Potatoes originated in the new World, in the Andes between Venezuela and Chile. In the beginning Germans were actually reluctant to growing potatoes – much to the chagrin of Frederic II. of Prussia. According to a legend, the king ordered his soldiers to guard a potato patch in order to trick his people into stealing the allegedly valuable plant. While potatoes are now widely consumed in modern Germany, numbers are shrinking since turn of the century. While potato consumption was 70 kilos per capita in 2000, it was around 57.7 kilos in 2015. However, if you want to whip up an easy and filling dish, potatoes are a must-cook. Arguably the only downside of cooking potatoes is the quite time consuming act of peeling. To make it less of a pain, invest in a proper peeler. The Jonas peeler has been a staple in Swedish kitchen since the 1950s. It’s stripped-down aesthetic and easy to clean stainless steel design makes it a reliable kitchen tool even in the 21st century. Tired of cutting a family’s worth of French fries by hand? Ditch the knife and hours of tiresome work for this convenient restaurant grade French fry cutter. Just like Sauerkraut and a Lederhosen-clad brass band, Eisbein aka Hachse or Haxn is part of every proper German meal. The preparation method and the name vary from region to region. However, it always refers to the part of the pig’s leg between knee or elbow joints and tarsal joints. Usually the meat is heavily marbled and covered under a thick layer of fat. Since it is cooked for an extended period of time the meat is tender and falls right off the bone. Up in the northern, western and eastern parts of Germany the cured and boiled version is much more common. It is mostly served with mashed potatoes or sauerkraut, in Berlin with mashed peas. In the southern parts, especially in Bavaria, Hachse is baked in the oven, resulting in a deliciously crunchy crust. Preparing Eisbein is quite simple – even more so if you have a pressure cooker at hand. German cooking ware purveyor Fissler’s Vitaquick pressure cooker is always a good choice. Its sleek design and innovative construction as well as its fool-proof safety features are valued by cooking beginners and pros alike. If you’re however more into southern German version, invest in a proper roasting pan. This Cuisinart 16-inch roaster is designed to hold a turkey, chicken, or Bavarian Hachse with ease. Riveted stainless steel handles make placing the roaster into the oven, and lifting it out, safe and hassle-free. Legend has it that after putting down the Italian revolution in 1848 Austrian field marshal Count Radetzky introduced Vienna to its now famous Schnitzel. While some historians are casting doubt on this popular narrative, there is, however, no doubt about the Schnitzel’s popularity in Germany. 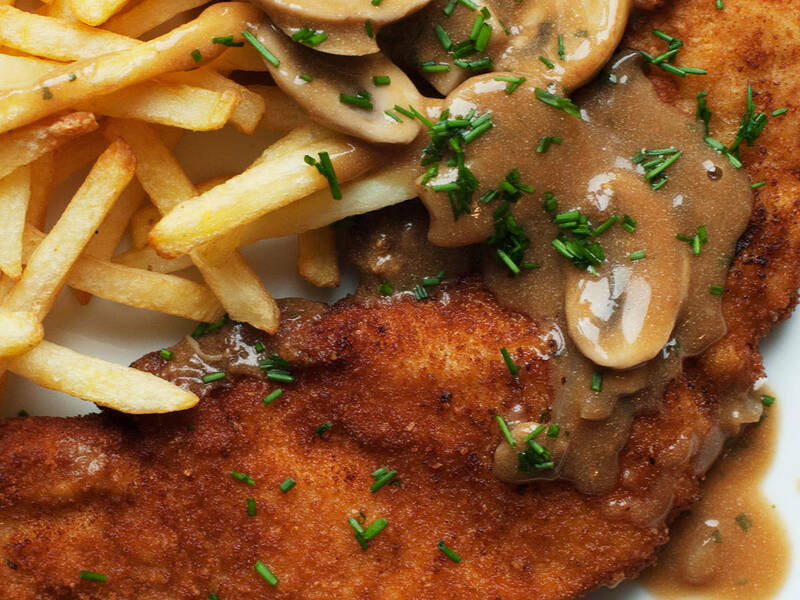 Be it classic Wiener Schnitzel, Jägerschnitzel or Cordon Bleu – Germans love a good Schnitzel. Its characteristic breading was invented as a creative way of making use of leftovers. Stale bread was turned into crumbs, which were then used for breading the Schnitzel. Traditionally Schnitzel is cut very thin and pounded flat with a meat hammer to break down the muscle fibers and thus tenderize the meat. For an authentic Schnitzel experience, I recommend this Norpro meat pounder made from easy to clean stainless steel. Keep the mess to a minimum with this set of breading trays.